Long before we held the story of Marilyn Monroe as the gold standard for Hollywood tragedy, there was Jean Harlow. She was beautiful and talented, a competent film comedienne (go rent Dinner At Eight). 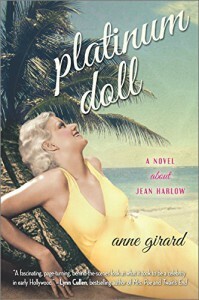 I picked up Platinum Doll because I love Old Hollywood fiction, and I hadn't read a Harlow biography before, though I know her story. Girard keeps the timeline limited to the beginning and peak of Harlow's fame, perhaps the few moment of happiness in life. You can't help but feel for young Harlean who wants a career and to please her overbearing mother (who makes Kris Jenner look complacent, damn) and her dissatisfied husband. Harlean/Jean sadly didn't have a long, happy life, but burned brightly like a star she was. I enjoyed this book. If you love classic Hollywood stories I think you'll enjoy this.